With the low Canadian dollar and cheap gas prices, I imagine many families are considering staycation options this year. Moreover, although Calgarians often point out Edmonton’s comparable distance to the Rockies as one of our shortcomings, the four hour drove to Jasper really isn’t that much to overcome. It’s definitely close enough for a weekend jaunt, and personally, knowing that a vacation from work is implausible over the next few months, a short getaway is exactly what I’ll need come spring. My familiarity with Jasper began only a few years ago as an adult, as Banff was my family’s destination of choice growing up. A weekend at the Jasper Park Lodge’s famed Christmas in November in 2014 opened my eyes to the town as a destination in winter. I continued learning about Jasper’s possibilities a few weeks ago, along with Mack and some other media folks, including Linda, Mike, Gail, Phil and Robyn. Tourism Jasper covered our accommodation, transportation and most of the meals that we enjoyed over the weekend. Jasper in January has been taking place for twenty seven years, and what started as a celebration of skiing and snowboarding at Marmot Bason has grown into a wide-ranging festival that features other winter sports, arts and food. Did you know that there is a shuttle that runs daily from Edmonton to Jasper? Well, neither did we, until we booked the Sundog Transportation and Tours bus. It departs from West Edmonton Mall at 3:50pm, to arrive in Jasper by 8pm, with brief stops in Hinton and Edson along the way ($89 one-way ticket for adults). The ride was comfortable, and as Mack noted, it was nice not to have to drive, especially after dark. 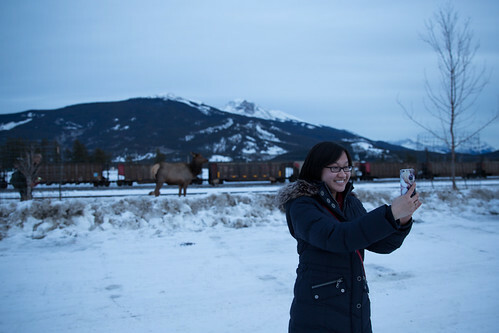 That said, the only departure time from Jasper back to Edmonton was at 7am – which means it wouldn’t be possible to make the most of a two-night trip to Jasper. We ended up carpooling home with Phil and Robyn to extend our stay into the afternoon. Also, as we were shuttled around the Jasper area as a group, had we been without a personal vehicle, it would have been difficult to make our way from one destination to another outside of anything within the town site. While taxis were a reliable source of transportation, they may not be the most economical solution for a holiday. The highlight of our visit was an afternoon at Marmot Meadows, a Parks Canada Winter Hub. Throughout the season, there will be opportunities to learn more about wildlife, Aboriginal culture, and winter activities at a site that encourages interaction with the outdoors. 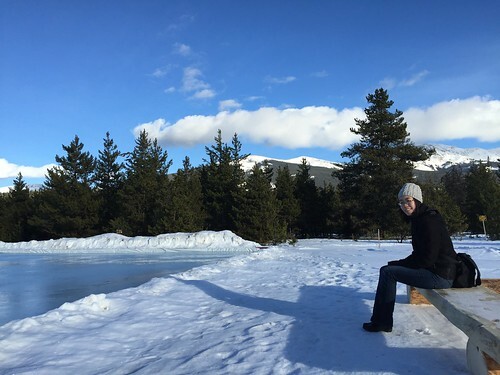 A skating rink was in the process of being formed (which, as a TV junkie, reminded me of the picturesque mountainside rink in the first season of Everwood), and a cross-country ski track was well-worn in the valley. Our group participated in a beginner snowshoe activity. 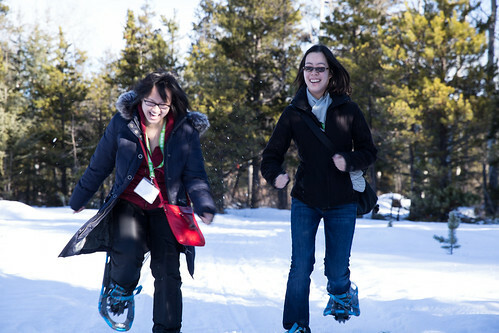 Unlike the snowshoes I remembered from my youth – those wooden frames based on more traditional models – Parks Canada staff introduced us to lighter, metal frame versions that were easier to use. We padded into the woods with our guide, relishing the steps into fresh, undisturbed powder. 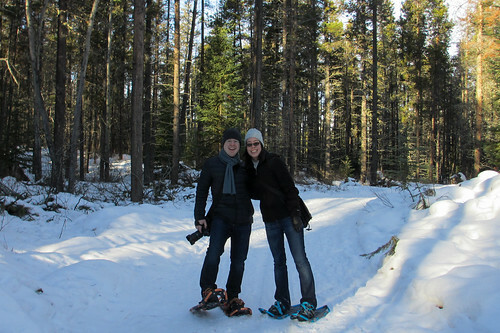 Left to our own devices, Linda and I engaged in some friendly competition, racing short distances in the snowshoes. It was the most fun I had all weekend, and a winter activity I am now inspired to continue in the future. 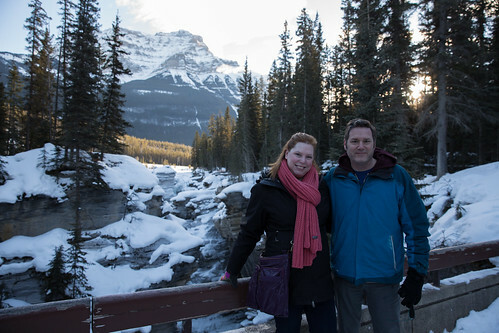 On Sunday, Phil and Robyn took us to some of their favourite natural wonders. 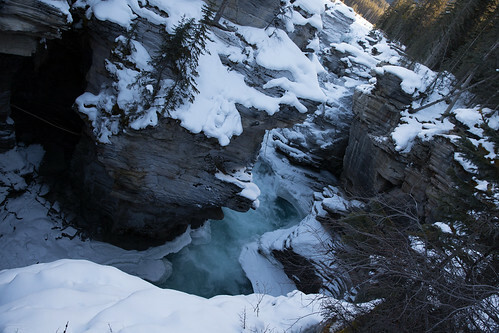 Athabasca Falls is beautiful in the warmer months, but is perhaps even more breathtaking in the winter, with cascades of ice and snow churning below. With the hard packed trail, it was obvious that many have come to admire the Falls in the winter. But given the parking lot was uncleared, and the walkways were for the most part snowed over and unsanded, it doesn’t seem to be an officially sanctioned attraction in the winter. Pyramid Lake, in the shadow of a peak that shares the same name, is set up as its own outdoor activity hub in the winter, and is only about a ten-minute drive from the town of Jasper. 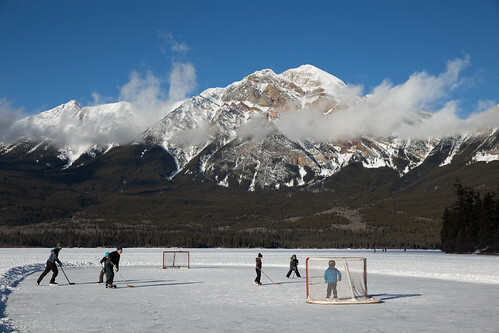 Mountain Park Lodges, which operates Pyramid Lake Resort adjacent to the lake, maintains several rinks and ski trails. They offer rentals for visitors without equipment, but we spotted many families who brought their own equipment for an afternoon of shinny, skating or cross-country skiing. In some ways, given the picture-perfect setting, we were surprised there wasn’t evidence of overt commercial sponsorships from national brewing or coffee brands. 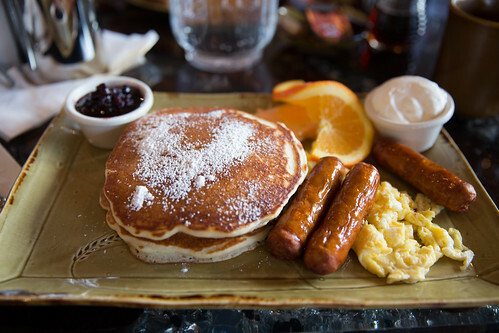 We had some fun throwing around curling logs, and warmed up in the lodge with some brunch. Afterwards, we took part in a genuine horse-drawn sleigh ride (no wheeled wagons here). At $25 per person, it could be a steep price to pay for families, but for us, it was a manageable cost that weekend. The rides are especially popular around the holidays, but continue to be offered on weekends until the end of March, conditions permitting. With the jangle of sleigh bells and the breathtaking mountain in front of us, it felt like a postcard experience. 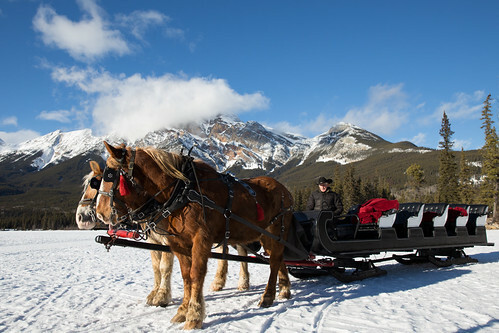 The sleigh even had fuzzy warm blankets for the ride, appreciated on that blustery afternoon. Jasper in January had three themed weekends: arts, appetites, and adventures, though some activities spnned multiple weeks. Our trip centred around appetites, and I’m happy to say, we discovered some culinary gems. The Wicked Cup is a great place to start your day. It’s a charming establishment with a restaurant, cafe and gift shop, and based on their brunch offerings, I wouldn’t hesitate to return for other meals. The pancakes ($10.50) I ordered were not for the faint of heart, served with a wild berry compote and whipped cream. They were fluffy and delicious, and yes, felt a bit like having dessert to start off the day. Jasper Brewing Company is a brew pub located within the town site. They have locations in Banff, Calgary and Fort McMurray, which all have individual identities and offer different signature brews. 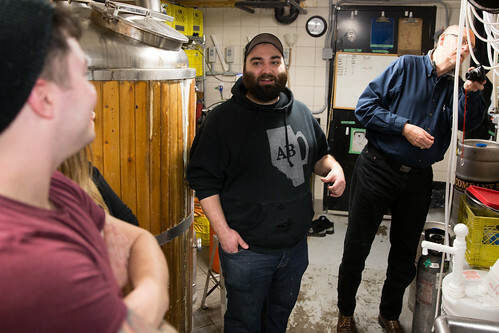 John Palko, the brewmaster in Jasper, was noncommittal about a future location in Edmonton, but didn’t rule it out. Their model is to sell their beer from the brew pub itself, with the exception of festivals or fundraisers they participate in. Jasper Brewing Company prides itself on serving fresh beer – from mash to pint in 10 days – and produced 115,000L in 2015. Their most popular beer is their Jasper the Bear honey ale. 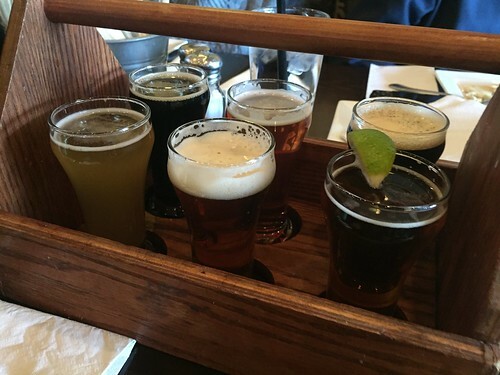 Mack tried a flight of their beers, which is a great way to sample the six they had on tap. His favourite ended up being the Liftline Cream Ale. 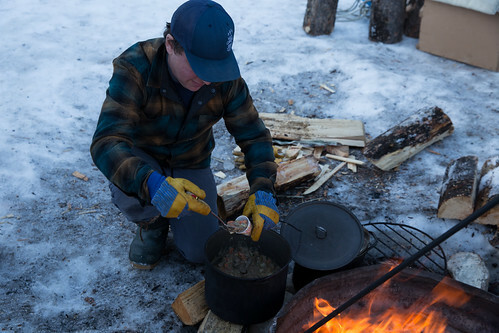 We also learned a bit about backcountry cooking at a session led by Wild Current. For winter camping excursions, because of the cold, it’s even more important that people stay hydrated and consume nutrient-rich foods. We sampled some rehydrated pastas and chilis (made by adding hot water directly to the package), as well as a stew put together by Wild Current staff. It was somewhat curious that instead of assembling the stew as a demonstration, we were told it had been put together off-site and just reheated on the campfire. Hopefully Parks Canada reworks the session in the future to make it more hands-on and interactive. For dinner, we were ushered to the majestic Fairmont Jasper Park Lodge. We enjoyed a three-course meal consisting of highlights from Orso Trattoria’s regular menu, and for me, dessert took the cake. 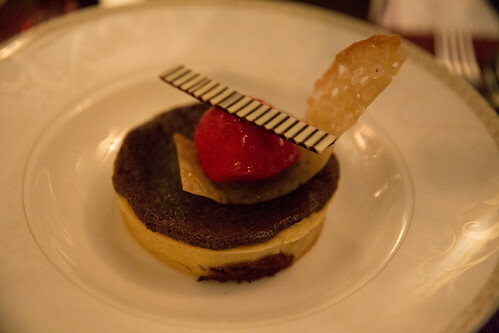 The Tarte de Nero, paired with a ten year Tawny Port, was a rich and satisfying way to end a wonderful evening. As has been my experience at the JPL, the service was once again top-notch. 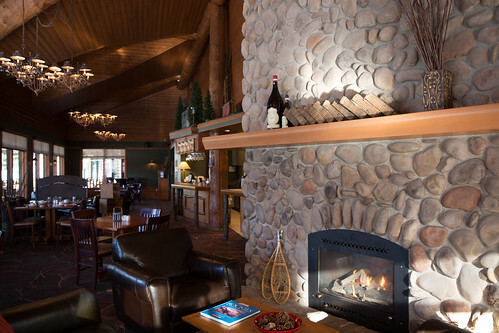 Wines in Winter is an annual wine tasting event hosted by Mountain Park Lodges. 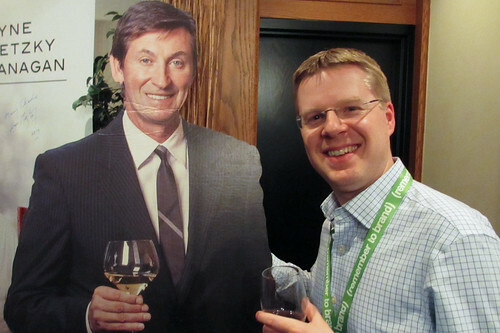 The $30 ticket was perhaps the best value item all weekend – besides the appetizers that were included within the price, attendees were able to sample over 100 different types of wine. I would have personally liked to have seen more Canadian wines represented, but we did find our way to the Ontario and BC labels being poured. Mack couldn’t help but be drawn to the Great One. Our last meal before departing for the weekend was both scenic and delicious (typically, it’s only one for two). The Pines Restaurant inside the Pyramid Lake Resort has a lakefront view, and is beautifully designed to take advantage of the panoramic sights. 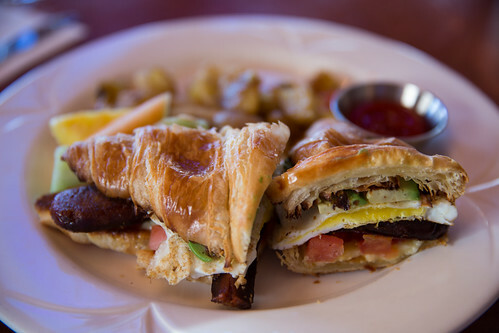 Mack and I both couldn’t resist the decadent croissantwich ($12), layered with a fried egg, avocado, tomatoes, chorizo, and cheddar. The only downside was perhaps not having the foresight to order two sandwiches each. If you’re planning to attend Jasper in January next year, take a look at Jasper in January for what to expect, or more broadly, at any time of year, on Tourism Jasper for ideas – I’m already looking forward to our next mini-break in the mountains. 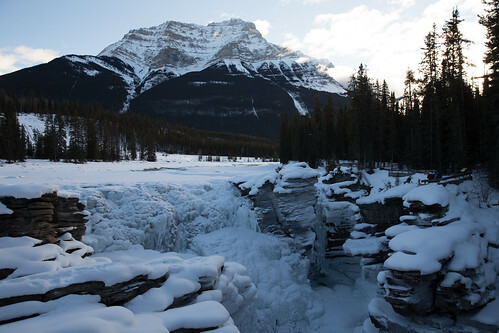 Thanks again to Tourism Jasper for the opportunity to further explore Jasper! Check out Mack’s post about our weekend here.